The Frugal Family Life: DVD Review :: "Peppa Pig: Cold Winter Day"
DVD Review :: "Peppa Pig: Cold Winter Day"
I was recently given the opportunity to review a "Peppa Pig: Cold Winter Day" DVD. As you all know, I have three young girls and they have always loved Peppa Pig. I am not being compensated for this review, with the exception of the DVD we received and are able to keep. My girls watched all 10 episodes on the DVD. This show is not only educational, but it's funny and entertaining as well. It teaches life lessons and the family is very kind to each other. When I asked my girls if they liked the DVD they excitedly said: "Yes!" I have to admit that even I enjoy Peppa Pig more than I do some other cartoons. It holds interest and I also like the English accent! My girls loved the DVD and enjoyed their time of entertainment. The only negative they said was that they had already seen most of the episodes on television....which just goes to further explain their enjoyment of this show! Here are a few details about the DVD. 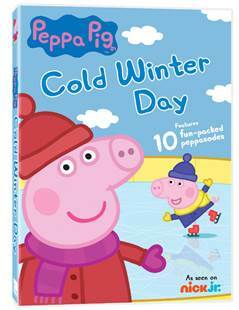 Make sure to look for Peppa Pig: Cold Winter Day in stores! It would make a great Christmas gift or stocking stuffer for that special little one! snowballs, race their sleds and much more!" world's most beloved preschool properties."